Hundreds of people attended an evening event this past Saturday titled, “Light for a Better World: A Celebration of U.S. Innovation” at the National Academy of Sciences. 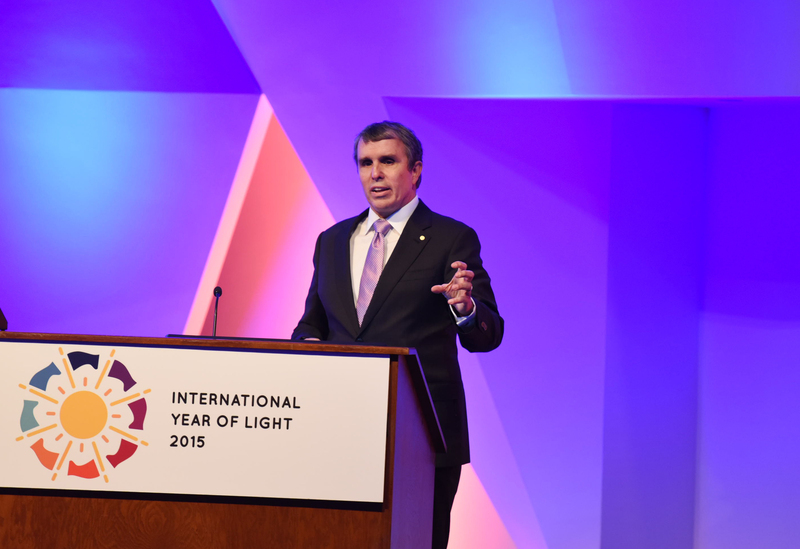 This was one of two flagship events anchoring International Year of Light and Light-Based Technologies (IYL 2015) celebration in the United States, and it featured several delightful lectures by a distinguished panel of speakers followed by a nice reception. 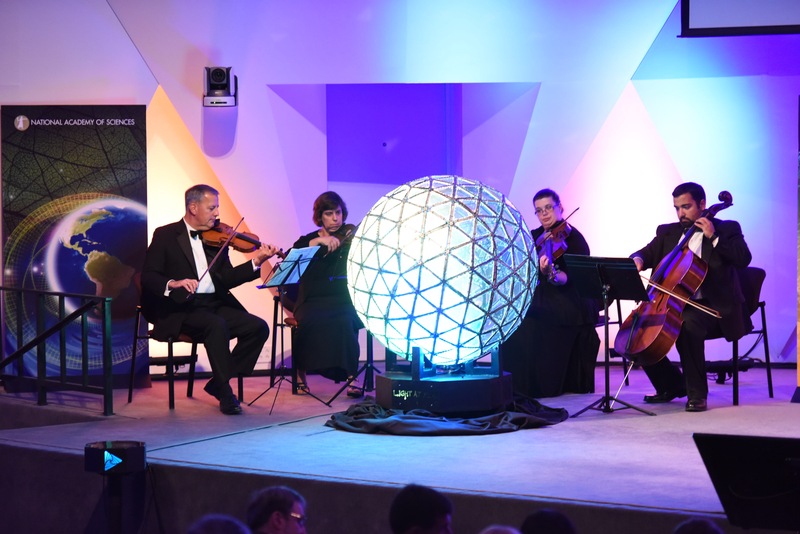 The evening was sponsored by the U.S. IYL 2015 organizing committee, which includes the National Science Foundation, National Academy of Sciences, The Optical Society, American Institute of Physics, American Physical Society, IEEE Photonics Society and SPIE. An earlier, daytime event called “Wonders of Light – Family Science Fun” at the Smithsonian’s National Museum of the American Indian where more than 500 people, largely children and their parents, were treated to more than a dozen booths offering hands-on activities. I will describe more about that daytime event in a separate blog. First, let me describe the evening event and how well the speakers there captured the dual themes reflected in the title: light innovation and working toward a better world. Musicians are bathed in LED light from the Radiance Orb, which responds to their playing before the start of the Light for a Better World celebration in Washington D.C. On September 12, 2015. Credit: Jason Socrates Bardi. The evening began with France Córdova welcoming the audience and speakers, thanking the sponsors and reflecting on the opening ceremony in Paris. “It is inspiring to see this global initiative continuing to raise awareness among the peoples of the world about the importance of light and optical technologies in their lives,” she said. Córdova is the director of the National Science Foundation, which is one of the leading funders of research related to light and light technologies. Moments before the event began, Córdova was waiting in the green room backstage with some of the other speakers, having an animated conversation. A moment later, Shuji Nakamura arrived, and Córdova excused herself from the conversation to go greet him, shaking his hand and saying, there’s my old friend! Speakers at Light for a Better World: A Celebration of U.S. 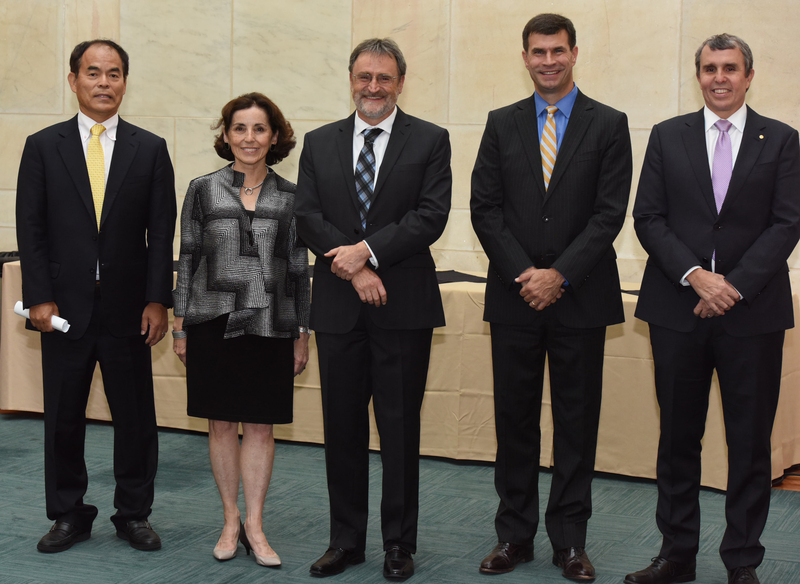 Innovation event included (left to right) 2014 Nobel laureate Shuji Nakamura (University of California, Santa Barbara), National Science Foundation director France Córdova, Michael Liehr (SUNY Polytechnic) Gerald Duffy (GE) and 2014 Nobel laureate Eric Betzig (HHMI Janelia Research Campus). Credit: Jason Socrates Bardi. A bit of that warm glow came across in Nakamura’s talk, which was one of the best descriptions of history and promise of LEDs I have ever heard. This was no surprise, really, since Nakamura’s own personal history is inexorably threaded into the fabric of the technology — his work developing the blue LED having been recognized with the Nobel Prize in Physics in 2014. In his talk, Nakamura described the incredibly difficult hill he climbed, and he included an amusing, audience-pleasing admission that he was really just trying to get more publications. He never really expected to succeed. “I never thought I could make that,” he said, referring to the GaN blue LED. But of course he did, and the world will never be the same. LEDs have widespread applications in fields as far flung as agriculture, medicine, automobiles and consumer electronics, but Nakamura described how perhaps their greatest future impact will be to dramatically reduce energy consumption. In California, where Nakamura lives and works (at the University of California, Santa Barbara), lighting accounts for some 35 percent of overall energy consumption. But by 2030 that could be cut in half through widespread implementation of LED lighting, Nakamura said. This would be equivalent to eliminating the need for 30 power plants each producing 100 MW hours. Nakamura also discussed second generation LEDs as well as third generation lighting based on laser diodes. “It’s incredible,” Nobel Laureate Eric Betzig said, reflecting on how far we’ve come with light technologies in the last 400 years. “And yet there’s still so much we don’t know.”. Credit: Jason Socrates Bardi. The next speaker was Eric Betzig. He described 400 years of history in 20 minutes, starting with the Dutch perspective glass, which led to the Galileo telescope, through the fighting geniuses of the 17th century, Robert Hooke and Isaac Newton; Leeuwenhoek’s strange and secretive ways; Huygens’ incredibly complicated aerial telescope; the tireless efforts William Herschel, whose sister fed him sandwiches as he worked so that he could continue unabated; and the tyrannical perfectionism of Carl Zeiss, who roved his factory floor with a hammer and smashed microscopes on the spot if they failed to meet his exacting standards. Betzig wrapped his talk by discussing adaptive optics and the development of PALM microscopy, for which he won the 2014 Nobel Prize in Chemistry. Just before the reception began later that evening, I chatted briefly with the next speaker Gerald Duffy, who is the General Manager of Global Product Development for GE Lighting. He admitted to me that he is a true believer, but he hardly needed to do it. Moments before he had spoken about trends in solid-state lighting and how the emerging technologies will change the world, and his passion was obvious throughout his talk. “It’s a tremendously important thing for our world to have artificial lighting,” he said. Duffy presented a graph showing the evolution of light bulbs from the first Edison incandescent to the most modern LEDs. What has always characterized this evolution is incomplete disruption: at no point has any emerging technology completely replaced what came before. We still use lots of incandescent bulbs today, for instance. That is changing with the advent of solid state lighting, he said, which will eclipse or has eclipsed every technology that came before. The final speaker was Michael Liehr of the SUNY Polytechnic Institute, who discussed integrated photonics and what the technology might do for our lives. He recently participated in a press conference with Vice President Joe Biden announcing the creation of a massive new public-private partnership called the American Institute for Manufacturing Integrated Photonics (AIM Photonics). You can read about it here. We have to develop technologies that will make products cheaper, faster and better, Liehr said, describing the center, which involves 55 companies, 20 major universities, 33 community colleges, nearly a dozen government agencies and 16 other organizations in 21 states. Its aim will be to help bring new technologies to market. Liehr’s talk caused me to reflect on Betzig’s earlier comments about how humbling it is to think of how far we’ve come in 400 years and how fun it will be to develop new tools and go further. 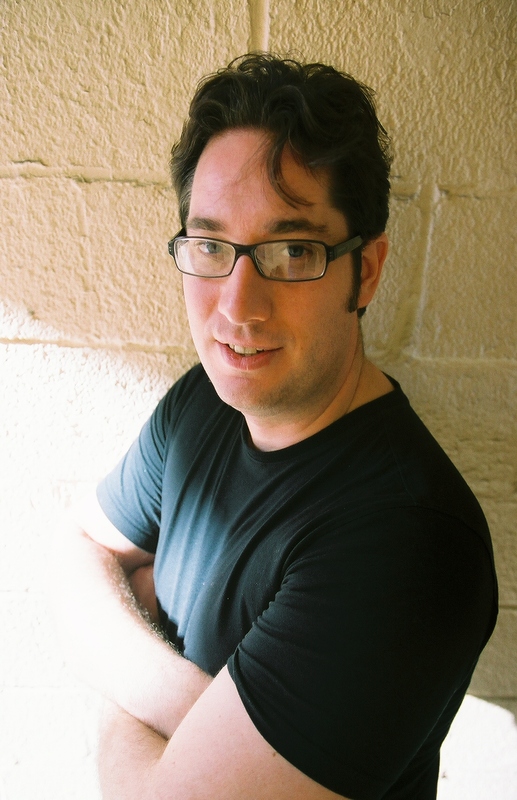 Jason Socrates Bardi is the Director of News and Media Services at the American Institute of Physics. He is a writer, photographer and videographer with a background in basic biomedical research on HIV/AIDS drug resistance. He obtained degrees in English, mathematics and physics from the University of Hartford in Connecticut and two separate master’s degrees in molecular biophysics and science writing from Johns Hopkins University in Baltimore, and he has worked as a science writer and/or senior press officer at NASA, the National Institutes of Health and the University of California, San Francisco.